So the time has come for you to revamp your soft furnishings. You’ve realised you need a change. But what do you do now? Well, you could go to a high street shop. You’ve got a vision in your head, but you can’t find exactly what you’re looking for, so you settle for something that’s close enough. Next time a friend comes over, their eyes fall on it. “Oh, we’ve got exactly the same at our place!” There’s nothing unique, nothing special, and nothing especially you, about it. Six months later, it’s falling apart, and you repeat the same process. Or you can try something different. Why not pay a visit to Butterley Barn, and get something made to last? This is your chance to find yourself a bespoke piece of interior design that will reflect your own character and tastes. Personalised, made-to-measure design doesn’t have to break the bank – as you’ll find out when you visit us. 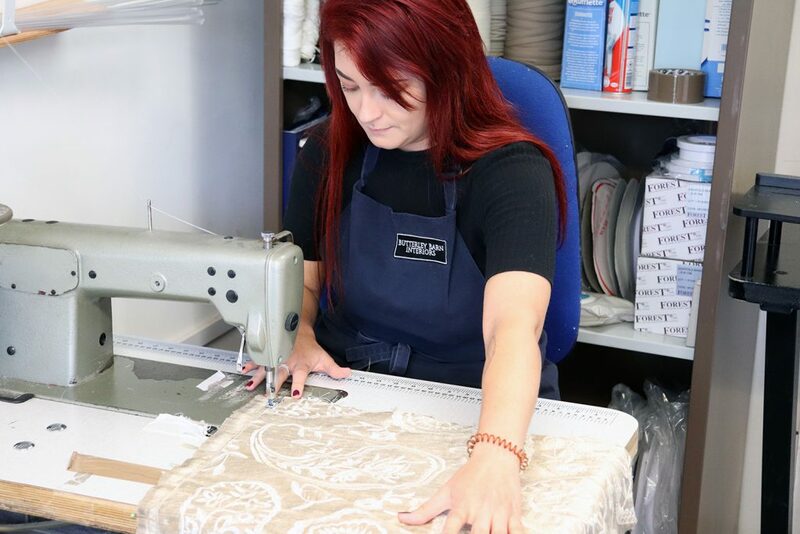 When a customer comes to our studio, in the charming town of Eccleshall, Staffordshire, they’ll step into an Aladdin’s Cave of fabrics, blinds and shutters. This is a thoughtfully curated collection that has to be seen to be believed. Inside Butterley Barn’s studio are hundreds of fabric samples of every colour and print imaginable, with something to suit all tastes and budgets. These fabrics have been carefully selected, with each piece chosen for its quality. There’s something for everyone, from classic prints to contemporary solids. Naturally, with gorgeous fabrics everywhere you look, you might feel a bit overwhelmed by so much choice. With such a huge selection, your perfect fabric is sure to be here somewhere… but where exactly? Luckily, our friendly team are on hand. Jennie, the owner of Butterley Barn, has over 20 years’ experience, and is always happy to answer your questions. To help you visualise your dream interior, Butterley Barn stocks a huge number of books, colours, cards, charts and samples. If you’re interested in a new set of blinds or shutters, there’s even a specific room in the studio dedicated to them, with plenty of styles to inspire you and help you make up your mind. Sometimes clients arrive with a complete picture in their mind’s eye of exactly what colours, textures, styles and patterns they want; others, who don’t have a clear idea, require a complete consultation. Either way – whether you require just a little advice or a bit more guidance – Jennie and her team are delighted to help bring your visions to life. 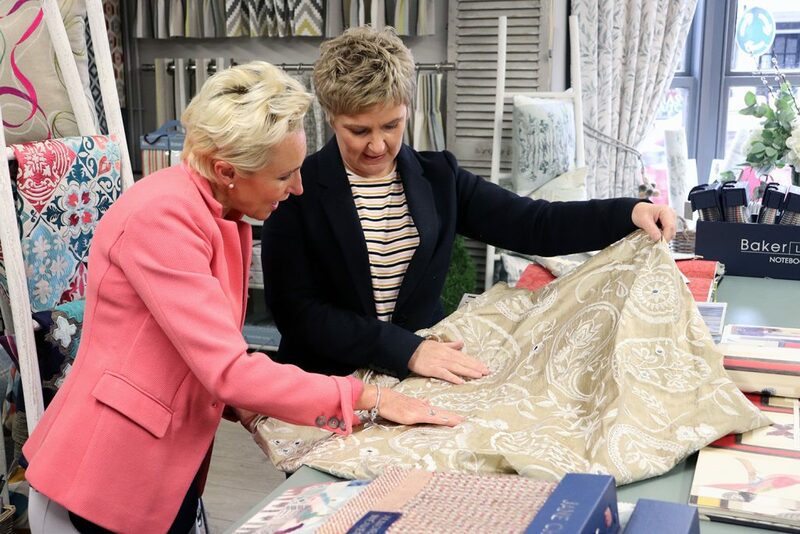 Once you’ve selected your fabric and decided on the design of your Roman blinds, curtains, cushions or other types of soft furnishing, it’s time for the next step. To ensure that everything is made to the correct dimensions, our team will pop by your home. This house call is a chance for us to visualise how your chosen style will work. We’ll take a look at your lighting and the current way that you use your space. Of course, we’ll measure everything down to the last millimetre – nobody wants an unpleasant surprise when it comes to curtains that are too big or too small! Remember, our team are all experts in this area. That’s why they’re so well-equipped to give customers advice on what will or won’t work. At the end of the home consultation, both you and the team at Butterley Barn will have an excellent idea of what exactly your soft furnishings will look like. The consultation process gives you the chance to develop something totally bespoke, designed specifically for you and your home. Rather than buying something off-the-shelf, you can be content in the knowledge that you have a tailor-made interior design piece. The consultation process also allows for complete customisation. Have you always dreamed of adding your own personal touch to your cushions or curtains? We can add that in, with charming bespoke details like beads, crystals or pom-poms. If you have an idea in your head, we’ll do our best to turn it into reality. Our goal at the end of this process is the same as yours: to create something truly unique, inspiring, and that will fill you with pride when you look at it. So select your design details and let your true personality shine through in your choices. Now, it’s time for you to sit back, relax, and let the professionals at Butterley Barn get to work. The vast majority of Butterley Barn’s products are made onsite, right in the comfort of our Staffordshire studio. Everything we make is crafted with care and attention – and built to last. Our team are experienced artisans, who will take all the time that you deserve to make you a beautifully hand-stitched product. At Butterley Barn, we reject the “fast fashion” ethos that infects the high street nowadays. We use traditional methods, and we don’t cut corners. That’s why our finished, handmade designs are just as durable as they are beautiful. When we’ve finished our meticulous work, and it has passed our quality assurance process, it’s time to take your new items home. Again, this is something that we’ll take full responsibility for. If you’re getting curtains, blinds, or something that requires installation, our team will set up an appointment to come to your home and get to work. Finally, you can enjoy the finished product, bringing a new spark to your home. Throughout every step of this process – from your initial visit to the studio, to our home consultation, the crafting process, and the installation – we will take great care and do our best to provide you with exactly what you want. However, we know that sometimes it doesn’t quite work out. That’s why our products come with a satisfaction guarantee. If you’re not happy, let us know. The last thing we want to see is a disappointed customer, who feels that our product hasn’t met their expectations. Now, when your friends come to visit, there’ll be no danger of them recognising your furniture as something they’ve seen in any old high street shop. Instead, they’re sure to ask where you bought it – because what you have is so uniquely you. And you won’t have to replace it any time soon, either, thanks to our painstaking workmanship. So when it’s time to revamp your soft furnishings, try the Butterley Barn experience. It’s something new, something different, and it won’t cost the earth. These charming cushions, curtains, blinds and wall coverings – designed to your specifications, and crafted using traditional techniques that have stood the test of time – are the perfect way to transform your house into something far more special: your home. If you’re interested, come and drop by our Butterley Barn studio to see how our team of experts can make a difference to you!